This Torchlight achievement guide is better late than never. 😛 Only for serious achievement hunters. You should hopefully have this before you finish the game, but if not here is a shortcut. You’ll need a decent gold reserve. Next you’ll want to go through the first floor of the mines and start picking up every item you see. This way, you’ll have a bunch of really crappy items that have low gold maintenance costs so you’re free to enchant a large number of items. The disenchanting rate on a new item is a mere 2% so if you run out of items, head back to first level and farm some more items. Download Hotspot Outside Link(Click Here). Hotspot is a mod management tool which has a database of mods to download, and will show you if any conflict with one another. Install and set-up Hotspot. To avoid problems I recommend installing to C:\Users\\AppData\Roaming\runic games\torchlight. The Torchlight folder at the end of the chain is where the mods folder is located as well. Get familiar with Hotspot. Launch Hotspot and select the Manage Mods option which will take you to the holy land (of Torchlight modding). Once there you will see the mod categories to the left and the most recent/top mods of the week to the right. The middle portion will display a list of mods depending on which category you have selected from the left side. Install some mods! Now that you have a basic overview of Hotspot you will want to start installing mods. Browse the various categories and review the list of mods it generates in the middle portion. Once you see a mod that interests you click it to display details (on the right side). If it meets your requirements you will want to click the Install Mod button which is located above the middle portion. I recommend that you check for conflicts after installing a new mod. To do this click the Check For Conflicts button which is located to the left of the Install Mod button. If conflicts are found you will have to decide which mod to delete – unless you want to play with potentially game breaking bugs. Launch the game from Hotspot. You can do so by clicking the Run Torchlight button to the right of the Install Mod button – or from clicking the Play button from Hotspots initial start up screen. 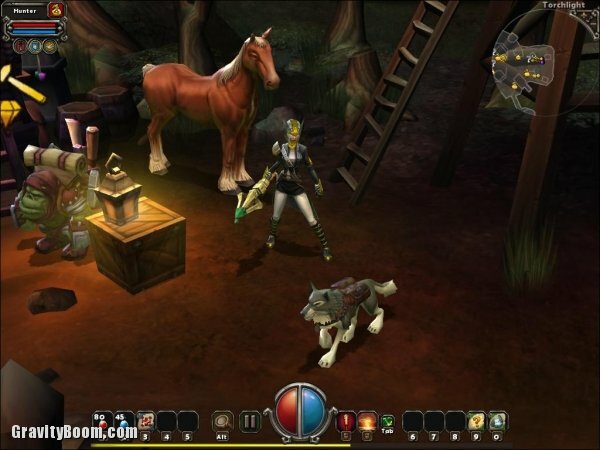 Launching Torchlight from Steam or without Hotspot running will tend not to launch the game without your installed mods. For this achievement, you need to feed your Pet a Pocketfish. Pocketfish can be caught at random from any fishing hole below dungeon level 5. If you’re going for the Fisher King achievement, then do some of the immense amount of fishing required below dungeon level 5 and you’ll be sure to catch a Pocketfish eventually. Items can be enchanted by Goren, an NPC in town. For the achievement, it is best to use a common item (since rarity increases the price). Percentage of disenchant is 2% per previous succesful enchantment plus 2%. Note that when, for example, you have 4% disenchant chance, this does not mean you have 96% chance of a succesful enchantment. This is because the game also has a chance that nothing will happen. Since the game saves only when loading a new map or when exiting to title, a convenient strategy is to terminate the game through task manager (ctrl+alt+delete) on a disenchant. The horse in question can be found close to the location you start the game from. Below you can see the exact location… and prepare to learn the ultimate wisdom of the universe! It is easier if you talk to the horse 100 times in a row. Some Torchlight achievements only trigger if you either save & exit or move to another screen. This is one of them. The Shadow Vault is unlocked after defeating Ordrak for the first time and is located in the Southeast area of town. Outside the entrance you will find Gar – a Pygmy Chanter who speaks gibberish. He will give you quests to complete within the Shadow Vault that revolve around defeating a Champion enemy and bringing back the Unique item it drops. In return Gar will reward you with Gold, XP, Fame, and an Enchanted item. Complete 25 of his quests to earn Universally Understood. The game only counts Champion Trolls from the Goblin Prison levels and will take multiple playthroughs and/or multiple trips to the Shadow Vault. One thing to keep in mind is that progress towards the achievement tends not to refresh until you change floors/areas. The achievement itself is easy and a time consumer, but you could be selling thousands of items that aren’t counting towards earning it. Keep that in mind! Hatch will appear in Torchlight once you activate the first waypoint on floor 4. You can find him North of the waypoint portal in town, and he will offer you a series of quests to accomplish. Hatch will summon a series of portals and ask you to retrieve an item for each; but only one at a time. Upon returning the quest item to him we will reward you with a combination of either Gold, XP, Fame, Spell Scrolls, Potions, and Equipment. Complete 50 of his quests to earn Down The Hatch. achievement, achievement guide, achievement hunter, Torchlight. Bookmark.